Are you serious? There’s an alternative to cooping up in a shrink’s office and dwelling on stories of Christmas past? I don’t enjoy visiting any sort of doctor, so while I may be a little biased, I know I’m not alone in indulging in the thrill of a much more exciting session of therapy… Retail Therapy! You’ve felt it before...that drab moment in time where you’ve lost perspective and are searching for a ray of light. The feeling resides in our subconscious and it surfaces for each person differently. For some, it’s excessive exhaustion. For others, it’s moments of lost temperament. Instead of finding your way to the fridge, or to the phone to call your mom, your solace is best found by driving down to your favorite boutique or department store for some good, old fashioned, retail therapy! Is it true? Does an ambiguously scent-filled store with snappy background music, an offer of a cold beverage, and the warm welcome of a friendly face provide enough sensory luster to bring you out of your funk? Almost! It may seem silly that the shameless swipe of that magical piece of plastic can bring you back to a happy reality, but it is, in fact, tried, tested, and proven, by divas and divos alike, that shopping really does dive deeper. While some form of discomfort may have put you in an anxious state, your mind unconsciously elicits the desire to solve the problem. 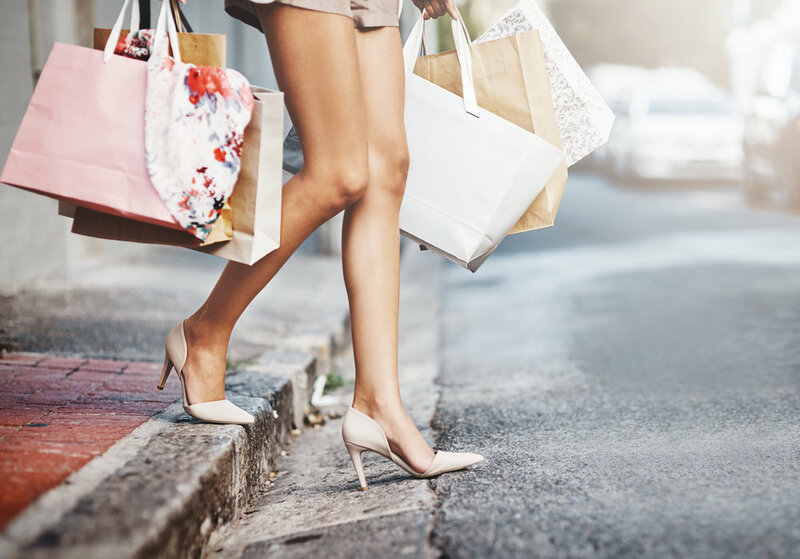 Believe it or not, the exercise of shopping instills emotions of ambition and forces your mind to move forward into a space of visualization and mental preparation. Interestingly enough, in the act of “retail therapy” it’s common to not even know what you’re shopping for—you just know that in that moment, something shiny and new is going to soothe your soul. This isn’t a placebo, or even a Band-Aid; it’s a healthy and valid coping mechanism. In introspection, it’s no surprise that abundant shopping surrounds some of the most joyful times in life. Getting married and having your first baby are two of the most celebrated transitions. The discovery of unknown experiences and new essentials during these stages evokes creativity. Each of these momentous occasions require extreme organization and preparation, notably, alongside the most important people in our lives. Although it’s common that retail indulgences are done on a whim, if you can plan to enjoy the experience alongside your love, the psychological benefits are even further boosted. If there’s one antidote to emotional despair, it’s human connection. (Furthermore, studies show that those with stronger social connections will live longer and healthier lives.) The approval of your sister or best friend isn’t just therapeutic—it’s almost like an ego-boost. Without intention, our malleable nature will make decisions based off of the opinions of those we trust, and, ironically, even the opinion of a stranger can influence the choices we make when shopping. Given my role as a retail storeowner, I have the pleasure of shopping alongside women and men in all stages of life. Regardless of age, origin, or career path, everyone can identify with being overwhelmed and in search of “me-time.” While it may seem like there aren’t any extra moments for a mid-day shopping indulgence, you should note that taking a break to go shopping is both physically and mentally healthy, and will actually boost your overall productivity. It’s no secret that shopping can change a lot of things. It can make you happy. It can transform the way you’re planning your day, or even your year. It can inspire and certainly amuse. So in the hustle of work and in the midst of taking care of everyone else with your other countless obligations, remember that you deserve a little jolt of joy, too! It doesn’t require justification—if you want to redecorate your space, do it! If you want a new set of L’Objet dishes to plan a dinner party with, don’t hesitate. You don’t need to choose one bracelet or the other—get them both! There’s no better time than the present to make another self-indulgent memory!